Sound "Precise, engaging, and dynamic"; has the "spookiness that really detailed, accurate equipment can convey." There was a "thin layer of artificiality that the CDA320 seemed to peel away and, thus, made the recording come to life in my living room where it previously had not." "The CDA320 makes for exciting listening."
. Additionally, the CDA320 can upsample both the incoming digital data stream and the data read from the unit's own transport. The upsampler has three options: 192kHz, 96kHz, and Bypass." Uses AKM Semiconductor AK4395 24-bit/192kHz delta-sigma digital-to-analog converters and a Philips VAM1202 transport mechanism. Use "My conclusion regarding the sonic differences between balanced and single-ended use of the CDA320? I wish I had one for you. The truth is that sometimes I could hear a difference and other times I could not." "I would not bet my life (or even a small amount of money) on being able to pick out any appreciable difference between Bypass and either 96kHz or 192kHz upsampling." With 500 horsepower, the 2006 BMW M5 has specifications that look absolutely stunning on paper. In recent years, however, BMW has been lambasted for what many auto enthusiasts see as technology overkill, exemplified by the iDrive system, which places the functions most important for driving and safety in the direct vicinity of the driver. I have not driven the current M5, but Riaz, a friend of mine, purchased a 2006 BMW 330i with iDrive, and, without going into detail, I see the point. The M5 adds yet another layer of complexity to iDrive by the addition of four buttons placed around the seven-speed sequential manual shift lever. Separate buttons control engine power, suspension stiffness, traction control, and shift speed. After saving your preferences to the aforementioned settings, you can activate them simultaneously by simply pushing the "M" button on the steering wheel. According to BMW's press materials, the combination of these settings yields 279 possible driving modes. For real. The point of this automotive preface in an audio review? The illustration of a simple-yet-perplexing question: Is there such a thing as too many user-controllable options? An example: the Stello CDA320, a single-box CD player and DAC. In addition to its abilities as a full-function CD player, the CDA320 will accept three PCM digital data streams (up to 24-bits and 96kHz) via its single RCA coaxial and two TosLink digital inputs. The fully balanced, class-A analog output stage also allows for balanced and single-ended connection -- and both balanced and single-ended output simultaneously. Additionally, the CDA320 can upsample both the incoming digital data stream and the data read from the unit's own transport. The upsampler has three options: 192kHz, 96kHz, and Bypass. The $1995 USD CDA320 utilizes a Philips VAM1202 transport mechanism that is compatible with any CD or CD-R. Except for one badly gouged CD, which my reference JoLida JD 100A CD player had slightly better luck reading, the CDA320 had no problems with either format. The CDA320 utilizes AKM Semiconductor AK4395 24-bit/192kHz delta-sigma digital-to-analog converters. The unit features two separate toroidal transformers, one each for analog and digital circuits. It is a standard-sized component, measuring 17"W x 4"H x 16"D, and weighs 18 pounds. The CDA320 is only available in one finish: machined-aluminum silver. The CDA320s remote is a plain plastic unit that doesn't even say "Stello" on it. A feature that I have not seen on any other CD player is the option to modify the scan-forward and -reverse buttons via the Fast button, which acts like a DVD player's multi-speed forward and reverse scan. Except for the lack of both digital-input and upsampling selection, I found the remote perfectly adequate. The player's display was very easy to read even from across the room. It does not have a provision for brightness, but I never had the desire to adjust it. The display shows track number and elapsed time and can be switched to show total elapsed time and switched again to show total remaining time. I would have liked to see track remain time as well, but I do not consider it a must-have feature. As you might be able to guess from everything I've explained, the Stello CDA320 is a challenging audio component to evaluate. It can output an analog signal in several different ways: balanced or single ended, with or without upsampling, and via an external transport. While most people will use the CDA320 as a standard CD player, even those people will be curious about the unit's many features, and talking a little about all of them is my job. I connected the Stello CDA320 to my Jungson JA-88D integrated amplifier via both the balanced and single-ended outputs. I have not had much direct experience with balanced equipment. By and large, balanced circuits are found in more expensive gear than what usually inhabits my system. In fact, I've never owned a CD player that even had the provision for a balanced connection, and while my last integrated amplifier, the DK Design VS-1, had such connections, it wasn't a fully balanced design. My Jungson JA-88D, however, is said to be truly balanced. My conclusion regarding the sonic differences between balanced and single-ended use of the CDA320? I wish I had one for you. The truth is that sometimes I could hear a difference and other times I could not. At its best, the balanced connection seemed to strip away the last bit of artificiality that was present via the unbalanced connection by removing background noise. The net effect was to make the music sound more like a live performance and less like reproduction. With well-recorded vocals, such as those on Cat Power's The Greatest [Matador OLE 626-2], the balanced connection seemed less constrained and gave the impression of a wider, deeper space. The vocals had both a more natural-sounding fade, and, when the track went silent, they were more dramatically punctuated once they began again. At times, the presence of the vocal track in the soundstage was downright spooky. I did not endlessly A/B balanced and unbalanced output, but I was more peaceful and content leaving the CDA320 connected balanced. Even if there is nothing obviously audibly better about the balanced connection in my system, avoiding audiophile insecurity is worth something to me. There was also the matter of the CDA320's upsampling, which I experimented with throughout the first month I lived with the unit. I played around with the upsampling over and over. I can sum up that month nicely by saying that I would not bet my life (or even a small amount of money) on being able to pick out any appreciable difference between Bypass and either 96kHz or 192kHz upsampling. Broadly, that was my experience in every playback configuration, with every CD I played. After a month or so, I pretty much left the Stello player set on Bypass. Occasionally, when the mood struck me, I would get up and restart a track after engaging upsampling, but nothing of real consequence happened. The fact is, I rooted for my ears to convince me that something was happening -- that the music was sounding better or worse or just different. In the end, nothing stood out about the different upsampling modes other than that all of them sounded equally precise, engaging, and dynamic. Getting on with it, I selected Bypass on the CDA320 and started listening to track one, "Hope There's Someone," from Antony and the Johnsons' I Am a Bird Now [Secretly Canadian 105]. A girl I was dating cried when she first heard this track after I played it for her several months ago. I don't listen to the album much because it is kind of strange and sad-sounding, but the recording is excellent, and the music is very different from most other stuff out there today. Antony sounds very much like Nina Simone, cabaret-style piano and all. Loudspeakers  Revel Concerta F12. Integrated amplifier  Jungson JA-88D. CD player  JoLida JD 100A. DVD player  Denon DVD-910. Interconnects  DH Labs Air Matrix, DH Labs BL-1 Series II. Speaker cables  Analysis Plus Oval 9 with Oval 12 jumpers. Digital cables  Analysis Plus Black coaxial cable, Analysis Plus TosLink cable. Power cords  Shunyata Research Diamondback. Power conditioner  Shunyata Research Hydra Model-6 with Copperhead power cord. Right away, I noted that something sounded different. This was confirmed when, later in the track, the sound of the piano took over the soundstage as Anthony banged on his instrument. The CDA320 conveyed the scale of the piano, which many CD players simply fail to do. Very often, digital piano sounds clinky and distant, like a boom box playing in the corner of an empty basement. Of course, I know this depends on many things, including the playing, miking, and mixing, but even when Antony delicately struck individual keys, I could picture and feel the vibration of the strings within the piano. As the strings were hit more forcefully, I could picture him drawing in the breath he needed to sing over the piano. It didn't make me cry, but I was moved. Something else was different as well. The piano and the vocal, while sounding rich and emotional, were also stripped of some of the haze I had previously thought was present on the recording. It was this thin layer of artificiality that the CDA320 seemed to peel away and thus made the recording come to life in my living room where it previously had not. There was an aching quality to the vocals that is really quite hard to describe, but which varies in its intensity even within the same song. It is small, nuanced characteristics such as this that the Stello CD player conveyed brilliantly. This is not, however, to be confused with what is the unlistenable, artificial outlining or accentuation of high frequencies. In moments when both piano and voice were silent, I could almost sense the presence of someone in the room, who, for the moment, was quiet. This is the spookiness that really detailed, accurate equipment can convey. I then removed I Am a Bird Now from the Stello and inserted it into my Denon DVD player. I selected the optical input, left the output on balanced, and started the track again. As I heard the first few notes of the piano, I was shocked. The sound was wonderful -- full, natural, and not noticeably inferior to that with the CDA320's own transport. When Antony began singing, however, I noticed a touch of grain to his voice. As the song continued, the piano was indeed superb-sounding, but the grain I noticed with the vocal never fully disappeared. Out of curiosity, I removed the coaxial cable from my JoLida CD player and plugged it into the DVD player. I selected the coax input on the CDA320 and played track one again, but it did not sound appreciably different to me from the optical input. In the manual, Stello suggests using the coaxial input for critical listening. I let the CD play through and randomly activated upsampling, but I failed to hear any difference between the three modes. I decided my DVD player was inferior to the Stello's own transport and that my foray into music CDs via the Denon was complete. There's something about listening to the same song a bunch of times in a row while trying to hear minute differences that just makes people dislike you. In the middle of a particular day I had set aside for listening, my friend Riaz dropped in unexpectedly because she was eating lunch in the area. I asked her if she wanted to hear anything in particular, and she said "something good." I put in Beth Gibbons' Out of Season [Go Beat 066574] and skipped directly to track eight, "Drake," because it features rich vocals, interesting synth work, a little harmonica, and more. The arrangement is something you might expect from Radiohead -- a very dense layering of tracks throughout the song. 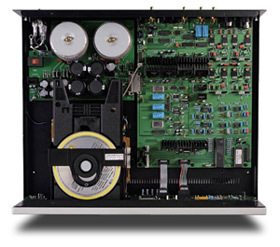 The silver brushed-aluminum chassis of the Stello CDA320 is an elegant touch for a CD player in the $2000 price range, but this unit's abundant user options and truly balanced circuit are the features of much more expensive products. The CDA320 competes above its station sonically as well. Its resolute, athletic sound pulled all of the detail from the CDs I played, and its tight bass gave music great rhythm and drive, especially the Telarc discs I played, whose bass is generally rich and warm -- in need of some firming. The CDA320's clarity pits it against the toned-down friendliness of softer-sounding players, and puts it in the company of some of the most resolving digital sources on the market. I consider it a poor man's Esoteric X-01 (without SACD playback), so unfettered is its sound. Of the CDA320's three upsampling modes, I preferred Bypass. The highest amount of upsampling, 192kHz, added a touch of high-frequency energy and commensurate glare, with 96kHz taking these things down a notch. Bypass left the innate resolution intact and banished the glare. The CDA320 sounds a little more pure balanced, but the improvement is not to the same degree as with other balanced digital sources. The point, however, is that you have a choice, as you do with so many of this CD player's options. Overall, the CDA320 offers very good value. If you're considering an Arcam CD player in particular, you should also investigate the CDA320, as you might prefer its sound, and you'd be able to connect a DVD player with true 24-bit/96kHz output (many of the older Pioneer models have this) in order to play Classic Records DADs, which will raise the sonic performance to even greater heights. Wow! I saw this tour a few years back, and Gibbons has great control over the microphone. It sometimes sounds like she is purring into it while you hear her take in a breath. From left to right, the stage seemed very solid and well balanced. In the vertical plane, the sound emanating from the speakers seemed lifelike and realistic in scale. Her voice was up front, but there was also a bass line throughout the song that anchored everything. I had never heard this song sound more involving. It sounded great, and Riaz said she was going to give this album another listen. She didn't like it much before hearing this song on my system. I had to agree, because as I sat struggling to articulate reasons I thought this was, by far, the most involving I had ever heard this song sound, the only words I could think of were: balanced, dynamic, and yet naturally pleasant. The music and the vocal formed a cohesive whole with neither dominating the soundstage to the detriment of the other. There was also a ton of detail, and the sound in front of me had a very quick, yet nuanced quality to it. Sound appeared, decayed, stopped, and started with impressive precision, and yet I did not experience fatigue at all. The sound was at times almost heart-stopping, but that was simply Gibbons ability to draw you into her world and let you feel what she is feeling. Suffice it to say, the lady feels things deeply, and with the Stello CD player in place, so will you. Truly, this is a CD player of which I never tired. On a regular basis, it startled me with its ability to make voices and instruments leap out. I'm not sure what more I could ask of it. The CDA320 makes for exciting listening. My resident CD player, the JoLida JD 100A, features a tube output stage, and I have always liked the way it presented vocals. At $900, it is a quite a bargain. Indeed, connecting the JoLida through its unbalanced outputs and inserting I Am a Bird Now resulted in an "uh-oh." It sounded really good. The vocal had a nice lingering decay to it, bass was very good, and the piano had substantial weight. Switching back to the Stello CDA320, the soundstage seemed a bit tidier, as the vocal and piano sounded more focused. Placement of the piano and the voice was more precise, but the vocal did not have quite the depth as through the JoLida player. As the CD continued, I appreciated how the notes of the piano filled my room. Whether the JoLida JD 100A was making the vocal more prominent or just smearing the piano a bit, I'm not sure. What the Stello player did consistently is sort all of this out, and, as a result, the piano and vocal sounded clean, clear, and dynamic. Those qualities were even more apparent on Goldfrapp's Supernature [Mute 9312-2], which, for the most part, is an upbeat, synth-driven dance album. The songs feature random electronic sounds, feedback, and distorted vocals. The JD 100A did not convey the energy and chaos of the songs quite as well. Once the Stello player leaves, I don't think I'll be playing the Goldfrapp album very much; it just sounds messy on the JoLida. As a whole, the tracks ended up sounding congested and for me, that's when boredom sets in, so the JoLida was done. One of my all-time favorite bands is Blonde Redhead. Spinning Melody of Certain Damaged Lemons [Touch and Go 216] is almost a religious experience for me. I think "Loved Despite Great Faults" is one of the showcase songs. It starts off quietly with some guitar and almost immediately a drum roll begins to build before the song explodes with the vocal, drum, bass, and guitar in full effect. So much of the song's energy depends on the ability to discern the attack of the drums and the hand that furiously slides up and down the neck of the guitar. Later, a cymbal is struck and everything else is silent as you hear the full seven seconds it takes to fade into silence before the guitar again explodes to life and it all starts again. As much as I like what the JoLida JD 100A does with vocals, it doesn't go quite far enough with everything else. By comparison, it seems to rob the music of some energy. It is to such a degree, in fact, that it is something that I can no longer ignore. The Stello CDA320 made me realize what I was missing and now there's no going back. You know how a good DJ can get you on your feet? That's the Stello CDA320. It grabs you -- you listen, you participate, you feel. This brings us back to the BMW and all those user-controlled options. Inserting the Stello CDA320 into my system resulted in the ability to listen to a CD in 26 different ways (yes, I counted). I am factoring in the upsampling and both of the CDA320's output options in case, for example, you are wondering how two connections can yield six playback modes. Twenty-six is a big number. But let's think about it. If you purchased the CDA320, chances are good that you would not have another CD player in your system. In my system, that means the playback modes get cut to 19. It probably won't take you the rest of your life to figure out which ways of listening you prefer among 19 choices or even 26. However, by and large, all this configuration madness yields, at best, slight differences that make the whole exercise pretty unsatisfying. But (and this is a big "but") the crazy thing is, I cannot fault the performance of this CD player in the slightest. It's that good -- that satisfying musically. The CDA320 is an equal opportunity conveyor of music. Yes, the tweaking part is an initial letdown because you expect it to transform the sound, and you feel as if part of the hard-earned two grand paid for this CD player has been wasted. However, as you get familiar with its performance, you'll be grateful that the sonic character of the CDA320 remains a constant. Connect it with your XLR cables if you can, with your RCAs if you can't, set it to Bypass, and enjoy.